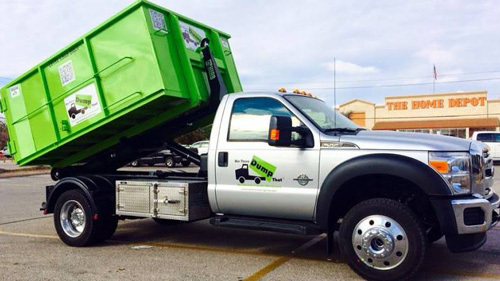 https://atlanta.bintheredumpthatusa.com/dumpster-rental-dunwoody	Bin There Dump That Atlanta	https://atlanta.bintheredumpthatusa.com/img/franchisees/6.jpg	, Atlanta, GA	Contact us for more details. Discover how we make renting a dumpster in Dunwoody, GA a simple and easy process. Bin There Dump That is committed to making the dumpster rental process for the customer a seamless transaction, from placing an order for the needed dumpster size to delivery of the waste container in Dunwoody to an immediate pick up when you no longer need the bin on your driveway. There is a nifty list and video that lists everything that isn’t allowed to go into your dumpster rental. Other than those hazardous materials, a lot of other things are able to be put into the dumpster. From tiles from your old bathroom floor to old landscape that you’re uprooting for a brand new view, Bin There Dump That is here to help you for all of your dumpster needs. By offering a wide selection of dumpster sizes, we are catering to any project you want to do! Call one of our Dumpster Consultants in order to find out which dumpster is the right one for you! Located in Dekalb County with over 49,000 residents, Dunwoody Georgia was incorporated as a city on December 1, 2008. It was named after Civil War Confederate Major Charles Dunwody, that’s right one o. In 1970 the Dunwoody Village Shopping Center was constructed with a distinct Colonial Williamsburg architectural style. Since then, all other construction has followed suit giving Dunwoody a unique identity and sense of place. Dunwoody has several different districts. Georgetown was developed in the early 1960s. It is located near I-285. Georgetown consist of subdivisions and retail stores. Williamsburg is a commercial district located on the eastern edge. It has shopping centers and is centralized around shopping and dining. Winters Chapel is another district of the city and borders Peachtree Corners. It is named after the church Winters Chapel Methodist Church which has resided at its present location since the 1870s. Tilly Mill District is named after the pioneer Tilly family, who owned a 19th-century farm and mill, and connects Peachtree Industrial to Doraville. One of Dunwoody’s most historic buildings dates back to 1829, The Ebenezer Primitive Baptist Church. The church sits at the corner of Roberts Drive and Spalding Drive and is still active to this day. It is home to one of the oldest cemeteries in the city, where many of the founding fathers of Dunwoody are buried. With a headquarters in Dunwoody and Perimeter Center, the Atlanta Journal Constitution is one of the top employers of the city. (Coming in 3rd behind InterContinental Hotels Group and Walden Security). Georgia State University has a campus in Dunwoody, along with American InterContinental University and Troy University. Current zip codes are 30338, 30346, & 30360. The city can be accessed through I-285, Georgia State Rte 141 and GA 400, giving Bin There Dump That Dumpsters several access points to get a dumpster to you! Your local Dumpster Rental Experts Dunwoody dumpster rental operator is Kurt Anderson.